Today is our first reveal day for our November Release and we're sharing two new stamp sets and two new die sets today! We have a giveaway too so make sure you read all the way to the bottom of this post to see how to win! 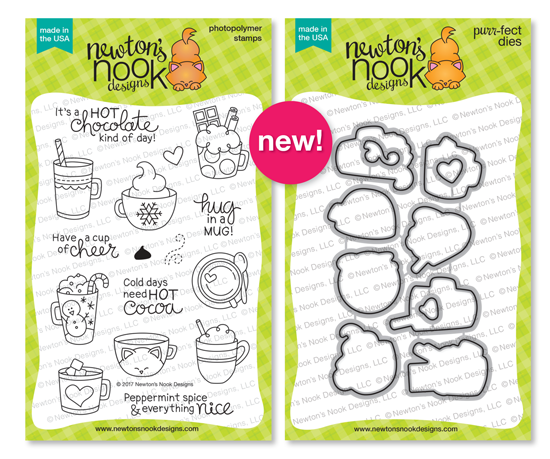 Send warm hot chocolate greetings with this yummy 4 x 6 stamp set. Some days call for Hot Chocolate and that's what this set is all about! These adorable little mugs will be so fun to color and use to send warm wishes to all the chocolate lovers in your life! This set has a variety of mug designs that can be used in the winter and throughout the whole year, whenever a "hug in a mug" is needed! What's better than one snowman? How about a whole crowd of Snowmen! 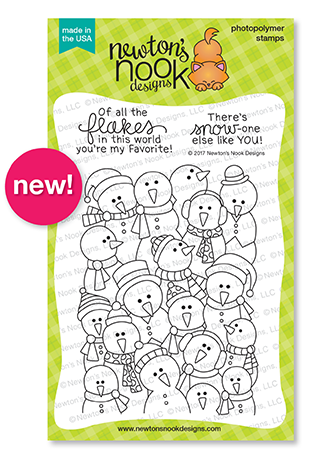 This fun 4 x6 stamp set includes one giant snowman stamp that is the just the right size to fill your card front! Add on the fun sentiments and that's all you need for a quick and cute winter card! The large snowman stamp also fits perfectly inside the scalloped frame die from our Flags and Frames die set. Create your own custom tag shapes with this fun set. This set features one large tag that is the perfect size for holding many of our stamped character images. After you die cut the tag, try cutting it again with one for the four mini stitched borders to create different tag bottoms. This set also includes a tag hole reinforcement circle and two fun decorative tabs that can be used to embellish the hole on the tag. 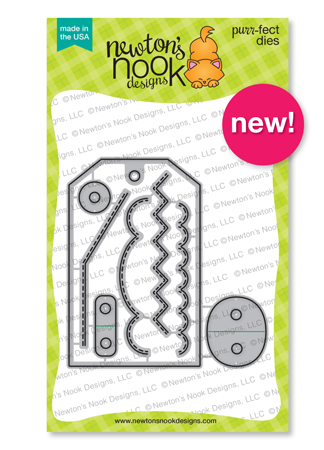 This set of dies includes some essential basic shapes that are perfect for card making. The large scallop edged rectangle is the perfect size to layer over a standard A4 sized card base and has a stitched detail. The rounded corner rectangle also has a fun stitched detail and can be cut out of the larger rectangle to create a frame or used on it's own. This set also includes three banner dies that are perfect for adding onto your cards and are a great size to stamp sentiments inside. Get inspired with these amazing projects from our Design Team! 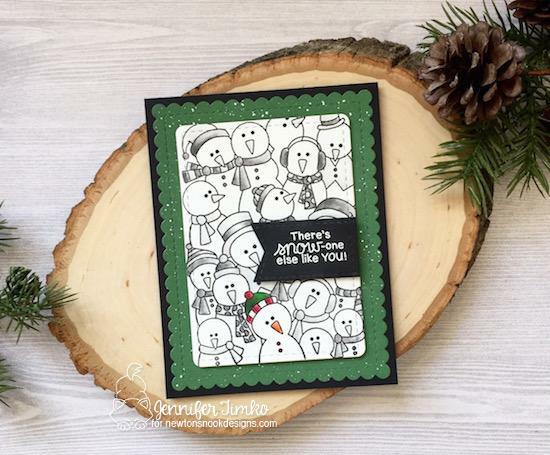 This sweet snowman card is by Juliana! 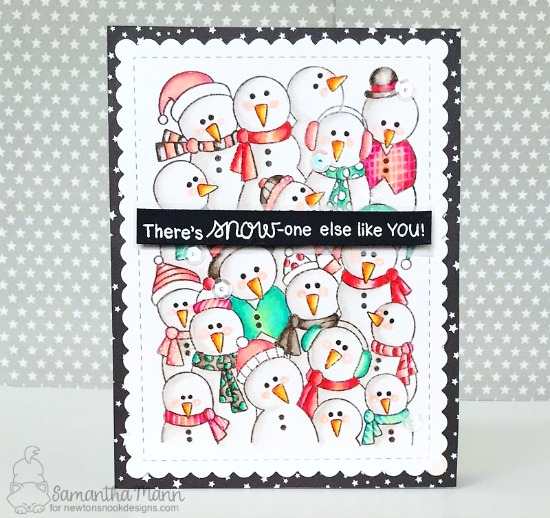 She used such fun bright colors on those snowmen from the new Frozen Fellowship Stamp Set! She also used the new Frames & Flags die set to cut out the fun scalloped card panel and the little banner too! 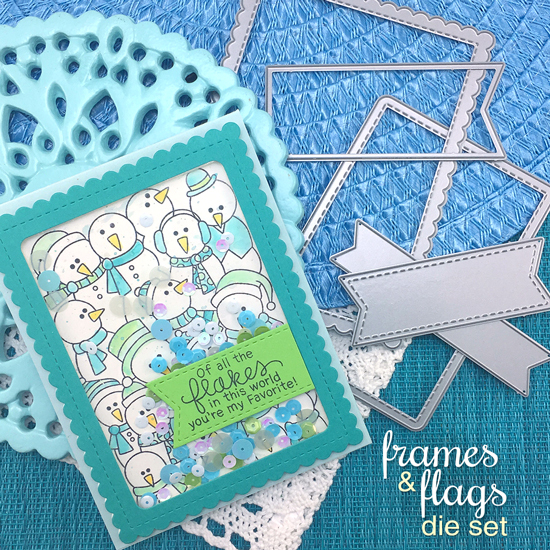 Maria created a whole set of adorable tags using our new Fancy Edges Tag Die Set. Isn't it cute how you can dress up the tags with different borders!? Then she added a fun mug onto each tag using the cute mugs from the new Cup of Cocoa Stamp set. 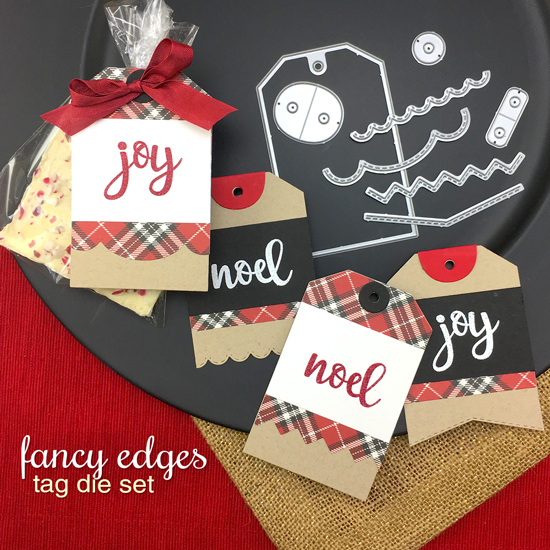 She also added a little bow to each tag using our Pines & Holly Die Set. This adorable ornament tag was created by Tatiana! 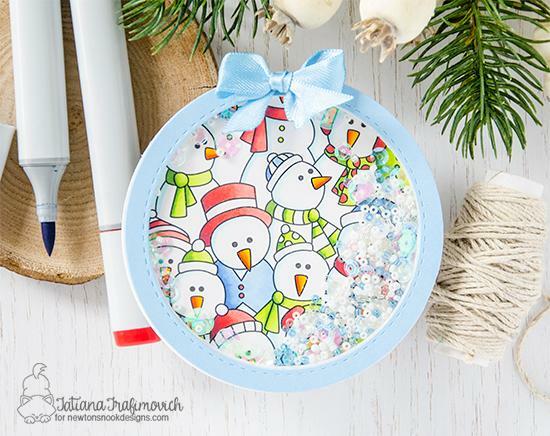 She used the big snowmen from the new Frozen Fellowship Stamp set and colored them in fun holiday colors to create a background for this fun circle shaker! 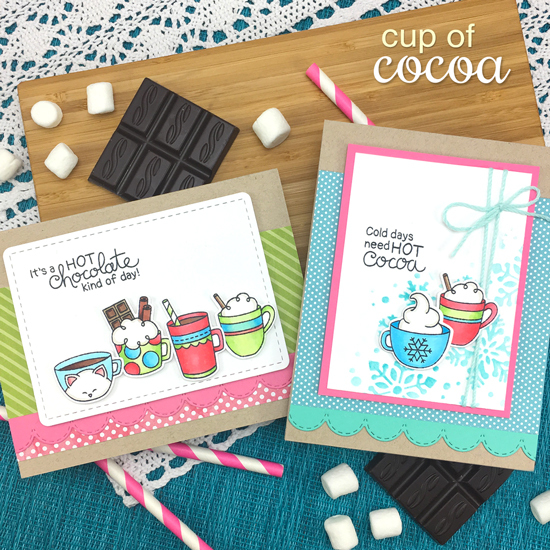 Ellen features our new Cup of Cocoa Stamp Set on this adorable holiday card! 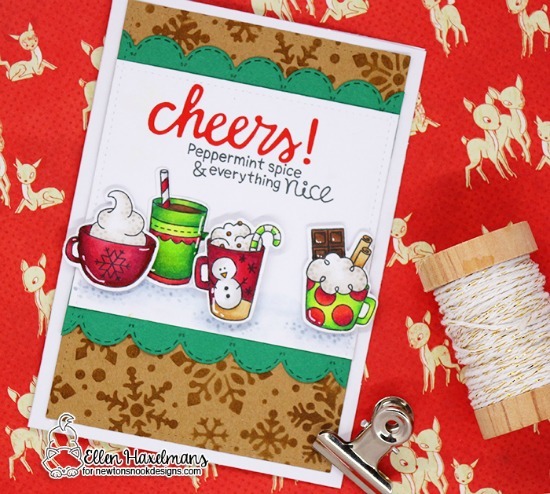 She colored the mugs in fun holiday colors and then added them to the card with the peppermint sentiment and the word "cheers" from the Cocktail Mixer Die Set. She also added some green scalloped borders using the Sky Borders Die Set and some snowflakes in the background using the Snowfall Stencil. The pink, mint and black color combo on this card by Samantha is so cute! 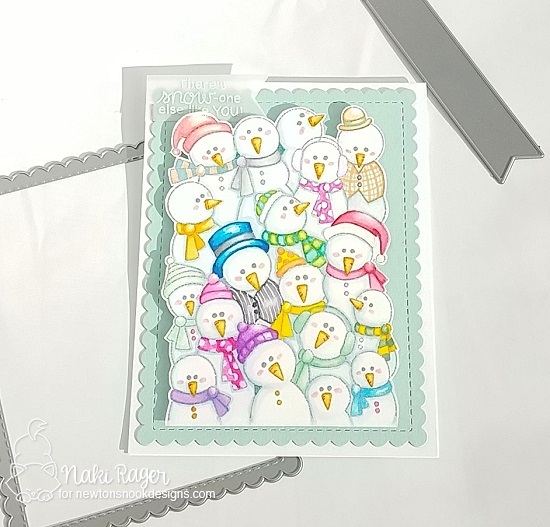 She colored all those adorable snowmen from the new Frozen Fellowship Stamp Set and trimmed out that fun scalloped card panel using the new Frames & Flags Die Set! 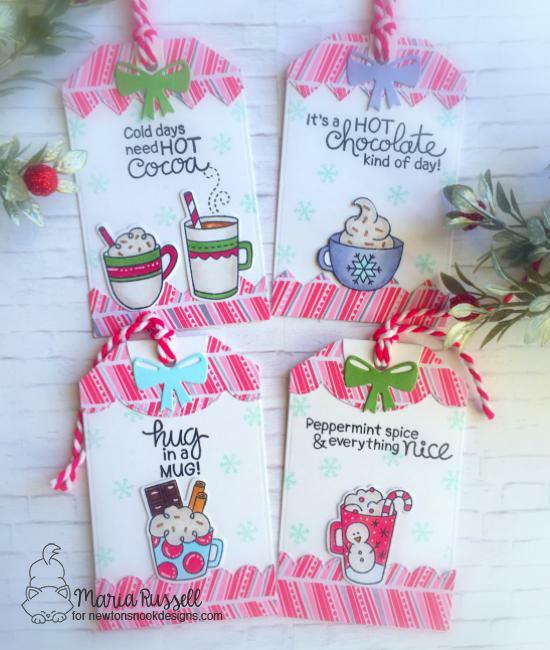 The row of mugs on this card by Larissa look so delicious! How would you choose which one to drink!? 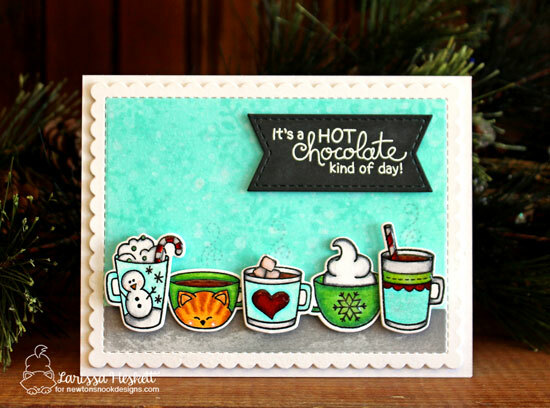 She created this cute card using the mugs from the new Cup of Cocoa Stamp set! She also cut out the fun scalloped card panel and stitched banner using the new Frames & Flags Die Set! This card by Jennifer is so clever! She colored all the snowmen from the Frozen Fellowship Stamp Set in grey tones except the one! It goes perfectly with the "There's snow-one else like you" sentiment! She also cut out the fun scalloped card panel and stitched banner using the new Frames & Flags Die Set! 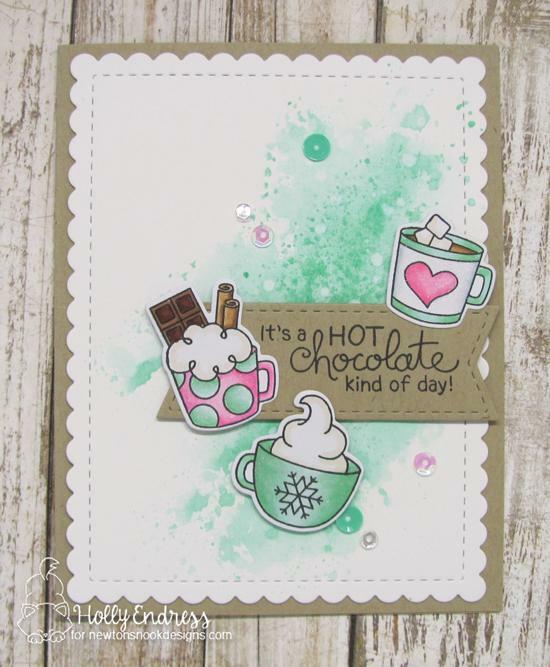 The mint and pink color combo on this card by Holly is so yummy! She used a trio of mugs from the new Cup of Cocoa Stamp Set and layered them over a fantastic watercolor background! She also used the fun scalloped card panel and stitched banner from the new Frames & Flags Die Set! 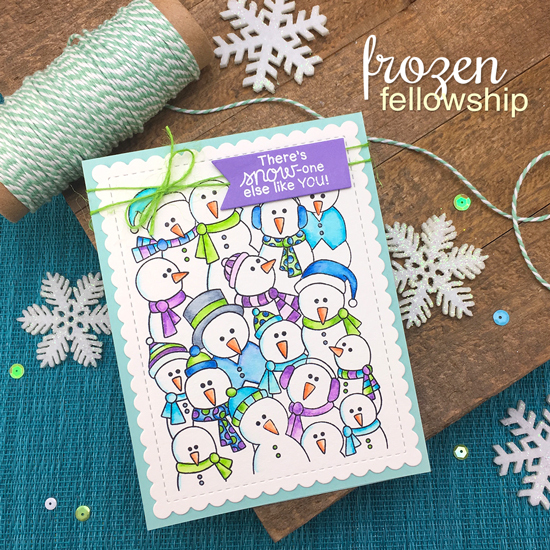 Naki created this awesome card featuring all those cute snowmen from the Frozen Fellowship Stamp Set. She used a ton of fun pretty pastels to color the snowmen and even added cute little pink cheeks! She also used the fun scalloped card panel and the skinny banner from the new Frames & Flags Die Set! 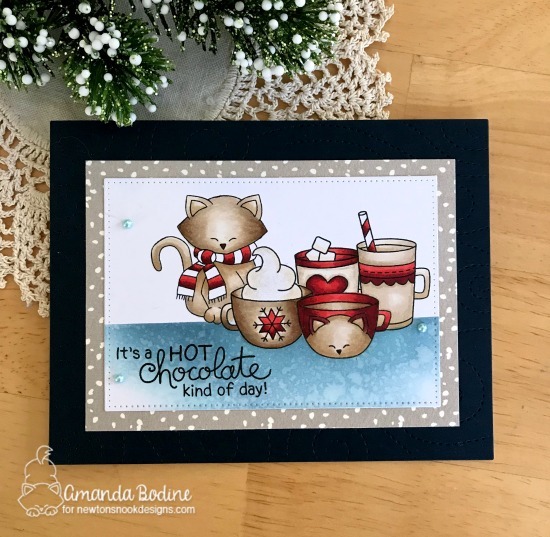 Amanda created this awesome hot chocolate card using our Cup of Cocoa Stamp set! It's so cute how she layered a bunch of mugs together and added Newton from the Newton's Holiday Mischief Stamp Set in the background! Would you like to win the “Cup of Cocoa” or the "Frozen Fellowship" Stamp Set? I am in love the mug and snowman stamp sets. Cute cards and thanks for sharing. Can't wait until release day. These are all so cute but I am in love with Jennifer’s card! I cannot wait to order this set and try this card!!! Wow... you have so much on tjis first day and not only that but they are all so creative! It gets you in Holiday mood! Oh my goodness! My wish list is growing. I love the fact that the snowmen fill the 'whole page'; will definitely save me from any masking (which I'm not good at). The mug set has that extra bit of detail in each image which makes it a super-duper set to have. Oh crap. I love literally everything from today's release and want it ALL. How am I ever going to choose wich items to buy first? Every single time I see a new Newton Nook product it gets added to my wish list. I have so many ideas for those cute mugs and the snowman shaker card it sooooooooo cute. oh this release is so adorable! but projects from all DT memebers are gorgeous! Love little Newton on the mug! love this release -- especially the snowmen! Oh, I love this stamp sets! They are awesome! The team made faboulous projects! Sorry, didn't mean to message twice! Everything is so cute! I love the Hot Chocolate stamp set. It will make cute packages for the "traffic personnel" at my granddaughter's school. My birthday is Friday and I would love them all!!! What a wonderful release!! Oh my! Loving the snowmen! Snowmen have been my "thing" at the holidays for as long as I can remember and I have collected many! And I will have to collect these too! SO cute!! Oh my, so much sweetnes and totally adorable. Wonderful samples. The mug set is awesome! Great cards! These are the cutest ever!!! Love the dies too. I'm in love with this entire release so far! There's so much goodness in this release. Loving the Fancy Edge Flag and Frame and Tags die. And the Cup of Cocoa is too adorable. I see Newton made an appearance on one of the cups. I LOVE these cocoa cards! So darling! Each card is so festive and fun! Love the new release! Both of these sets are so cute. I don’t know if I could ever pick. these are to die for! Frozen Fellowship would be my 1st choice. tried to comment on Maria's blog but couldn't find comments. Hello! You have to click on the particular blog post in order for the comment section to pop-up. Sorry about that. Thanks! I LOVE these little mugs of coffee and hot chocolate and all the snowmen! 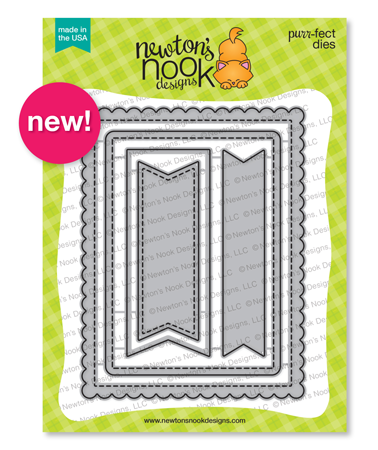 Great new die cuts too! My holiday budget is in trouble!! Ok, this is one of my favorite Christmas releases. I love both these sets. My birthday is in December, and then there is Christmas. Look at how I just rationalized getting both sets. LOVE these new things! This release is AMAZING!!!! The wishlist is growing! Thanks for all the wonderful inspiration. Those mugs are just the cutest! Gotta have them! Wow... lovin' this release! Everything. The snowmen stamp, the awesome tag dies, and those adorable mugs! Fabulous! Gorgeous! and fun creation, I sure love that whole crowd of snowmen! I'm in love with this release. I think my favorite is the mugs, but those tags can be used year round too. Love the new releases! So cute and fun! Snowman, cats and cocoa --fabulous! These are so stinkin cute! My first time seeing NND. Lots of beautiful ideas, I love both stamp sets, lots of possibilities with it. Cup of Cocoa is really a great new set. I specially love the cup with Newton on it! LOVE those snowmen! And the mug set it SO cute! I work at a preschool and on cold weather days we have many parents and grandparents drop-off coffee and cocoa for the office staff - this set would get a good workout for thank you notes!!!! Awesome first day...love the frames and flags die set! The stamp sets are adorable and love the dies too! The cards are amazing! As usual, I'm ending my blog hop with your blog. This is again a great release and all the creation of your team are fantastic and so inspiring ! I really had a great time discovering all of them. these new sets are just gorgeous - so fun - love the Frozen Fellowship!!!!! Another awesome release! I especially love the Cup of Cocoa stamp set. It was such a great first day ! These snowmen are so cute ! I think these new sets are wonderful. My family and friends would love cards made with these stamps. Oh my goodness - I can hardly wait for Friday. I just love those cute little snowmen!! That cup with the kitty face is too cute and I love that pile of snowmen ala Where's Waldo?!! I LOVE this entire release!! The DT has done a beautiful job showcasing everything. The frozen fellowship stamp is so cute! Love all the samples! The stamps are so cute! I love all the examples-adorable! I love these new stamps, especially the cup with Newton's face. I love Newton! Both of these stamps are absolutely adorable! Definitely must-haves!! Amazing new release! I love both of the new stamps...and oh my all the cute things you can do with the tag die. YAY for the new release!!!!! Love the design! What a fantastic design!